Commissioned by the King of Poland, “The Jagaloon Tapestries” is a series of seven pieces: The Forest, Iris, Woody, Timberland, Underwood, Wooden Hills and Woodland. Immaculate in their conception and finely crafted, each of the tapestries shows a portion of the woods in extraordinary detail. Each one of the seven pieces is reproduced as a portiere, which roughly translated means “door curtain” in French. In the age of large castles and no central heating, these tapestries were often hung over doorways and windows to reduce drafts. 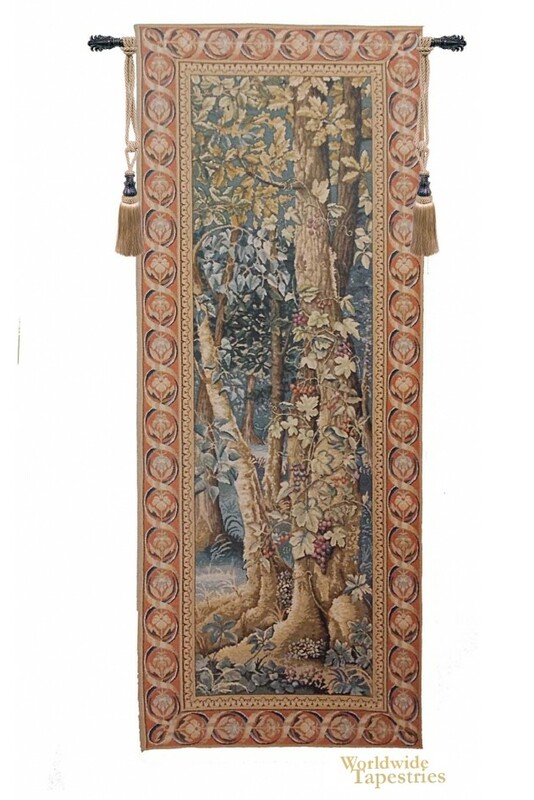 Underwood tapestry shows a forest scene of trees and ivy with a variety of green and blue green foliage. The original “Jagaloon Tapestries” can still be seen in the castle at Wawel, Krakow, Poland. This striking reproduction will look terrific in your great room. It looks even better with other pieces in the set, displayed either in pairs or threes. Underwood tapestry is lined on the back and has a tunnel for easy hanging. Note: tapestry rods and tassels, where pictured, are not included in the price. Dimensions: W 26" x H 65"